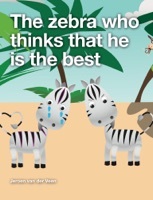 Raffie the zebra don't want to play with the other zebra Zoe, because he thinks Zoe isn't good enough. Read this book with your child and find out that it doesn't matter at all how the best. Much more important is that you're having fun!